Our free 5250 Emulator is designed to help you work with IBM i objects within the Eclipse framework. The plug-in allows you to start 5250 emulation sessions from within an Eclipse-based IDE. NOTE: This plug-in does not require the installation of any software on your IBM i and is compatible with RDi 7.5 + ( Eclipse 3.4x/3.5x), RDP + ( Eclipse ), WDSc 6 and 7 and Eclipse 3.0.x/3.2.x. Opens any number of 5250 sessions on any number of machines. Customizes colors, typeface, cursor shape, and more. Supports 24×80 and 27×132, the code page, and system requests. Assigns 5250 functions to your keyboard. Manages copy/paste; supports the hotkeys Ctrl+C and Ctrl+V. Automatically resizes the emulator when you expand or minimize the view. Records macro-commands for repetitive actions. Emulator for RDI – Download the tutorial click here. Emulator for WDSc – Download the tutorial click here. This complementary tool allows you to test executable IBM i components from within your WDSc 6 or 7 workspace. 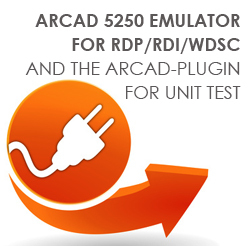 Our free plug-in for 5250 Unit Test requires you to create an RSE connection to your IBM i (provided with WDSc) and install the ARCAD 5250 Emulator for RDP/RDi/WDSc.